Everyone Anton Waker grew up with is corrupt. His parents deal in stolen goods and his first career is a partnership venture with his cousin Aria selling forged passports and social security cards to illegal aliens. Anton longs for a less questionable way of living in the world and by his late twenties has reinvented himself as a successful middle manager. Then a routine security check suggests that things are not quite what they appear. And Aria begins blackmailing him to do one last job for her. But the seemingly simple job proves to have profound and unexpected repercussions. For reasons that were difficult to think about in any great detail, let alone explain to his wife in New York, Anton had rented a room on the island of Ischia for the off-season. In exchange for a hundred euros a month and the understanding that he’d wash his own towels, he was given a small blue-painted room overlooking the Tyrrhenian Sea with the outline of Capri visible in clear weather against the edge of the sky. For the first few days the silence was miraculous, and he thought he might finally have found what he was looking for. His wedding had taken place six days prior to his arrival on the island, after a long and frankly disastrous engagement: Sophie found a dress, bought it, had a panic attack when she tried it on at home, and canceled the wedding. This was a fantastically costly maneuver involving several dozen hours of therapy at three hundred dollars an hour and a mailing of two hundred uninvitations: “The wedding of Sophie Berenhardt and Anton Waker has been post-poned for personal reasons. Thank you for your understanding.” She informed him that there was no hyphen in “postponed,” took up meditation in addition to the therapy, and came to him a month later with the news that she’d had an epiphany: the wedding was meant to be. Two hundred and fifty all-new wedding invitations were mailed out, in shades of spring violet; the flowers blossoming in the corners of the invite, she told him, represented rebirth. Anton had just been reading about how violets pinned to a girl’s lapel in a certain era had represented lesbianism, but chose not to mention this. Two hundred and one RSVPs arrived without incident. She showed up at work during his lunch break in tears, clutching the two hundred and second. All it said was “We’re so glad for you! We’ll be there!” and it was only from someone’s obligatory aunt, but he knew before she spoke that the wedding was off again. She was scared, she said. It wasn’t him. She just needed more time. “Because I really love her,” he told his friend Gary, in response to a question. He canceled the hall and the caterer and sent out two hundred and fifty uninvitations in shades of blue. The wording on these was much the same, except that she removed the hyphen between “post” and “poned,” and then he added the word “indefinitely” right before he sent it to the printers, and then he had to sleep on the couch for two nights. They spent a polite six weeks avoiding the topic. He wasn’t sure what to do, but he told himself he’d always known she was flighty and should have seen this whole mess coming. Marrying her was the only course of action that seemed honorable. He was living in a strange limbo wherein he couldn’t remember if he loved her or not and he sometimes felt he was losing his mind. He took endless walks through the streets of Manhattan and didn’t sleep well. In the evenings while Sophie was working he spent a lot of time with his cat; Jim lay across his lap and purred while Anton read. Their friends went to absurd lengths to avoid bringing up the wedding. Everyone was terrifically sympathetic. The therapy bills were stupendous. Topics of conversation seemed to change abruptly when they entered rooms where their friends were sitting. He tried to protect her from all this as best he could and to make things generally as pleasant as possible—coffee in bed in the mornings whenever feasible, flowers every Saturday—and he could tell she was trying to keep the mournful cello music to a minimum and tried to appreciate the effort. He sat on the sofa outside the closed door of her study with the cat on his lap and lost himself in the unspeakable beauty of her music. “Third time’s more or less my outer limit,” said Anton, and tried to convey this to Sophie in much gentler terms later on (“I don’t want to pressure you, sweetie, but …”) and she took it fairly well initially, but then played what sounded like funeral music in her study for days. When he cracked open the study door to see if she wanted to talk about it she just murmured, “I’m working,” without looking up from the score, which forced him to close the door again because they’d agreed that when Sophie was working no one could talk to her. He took long walks, read in cafés, went out for drinks with Gary and made very little progress on anything that week. The manager of the hall he’d booked for the two previous wedding attempts laughed and hung up on him, so he booked a new hall that was slightly more expensive and had been his first choice from the beginning, mailed out three hundred new invitations with a completely different color scheme, agreed with Sophie that it would probably be best if she let him handle the RSVPs this time, and set about relaunching the catering, floral decoration, and wedding-music operations. Some of her old friends from Juilliard had a rock band on the side, so he booked them against his better judgment and tried not to think about what the music might sound like. All three hundred guests RSVP’d in the affirmative almost immediately—most, he suspected, out of sheer curiosity—and Sophie seemed happy and uncharacteristically calm, although she was playing a lot of frenetic atonal modern music in the evenings. On the day itself she was a vision, dark curls and white silk and the plunge of her neckline, blue necklace on pale skin. It was an evening wedding in a church lit with nearly a thousand candles, and time skipped and moved strangely in the half-light. He was watching her float down the aisle, there were candles everywhere and so many roses that the scent and the candle smoke made him dizzy, she was beside him, they were listening to the priest and he couldn’t retain a single word that was being said. She was a mirage in the candlelight and he stood beside her in a kind of suspended animation, he was kissing her, Gary hadn’t forgotten the rings, I now pronounce you husband and wife. The band wasn’t nearly as bad as it could have been, his new wedding suit was less uncomfortable to dance in than he would have expected, they stayed at the reception til three in the morning, at intervals he heard himself laughing and he felt that he was observing the scene from some distance away. Time seemed to be moving very rapidly now. He drank champagne and danced with his bride. His friend Ilieva put a flower behind his ear and he left it there for an hour. He felt strangely still inside through the whole thing, calmer than he thought a man getting married really should be—but it wasn’t until he was thirty thousand feet over the Atlantic Ocean the next day, Sophie asleep in the seat beside him, that he realized he’d been confusing calm with indifference. He wasn’t, now that he thought about it, calm at all. Nor had he fallen out of love, exactly—indifference was the wrong word, it was something softer and more precise—but he also wasn’t at all sure that he should have married her. His exhausted bride slept on unaware. Emily St. John Mandel was born on the west coast of British Columbia, Canada. She studied at The School of Toronto Dance Theatre and lived briefly in Montreal before relocating to New York. 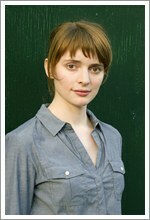 Her first novel,Last Night in Montreal, was a finalist for Foreword Magazine’s 2009 Book of the Year. 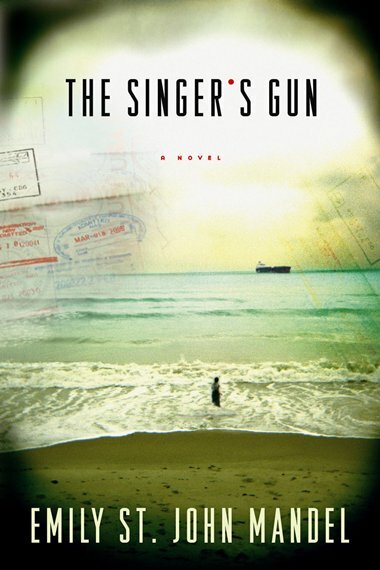 Her second novel, The Singer’s Gun, recently released in paperback, won the Indie Bookseller’s Choice Award and was the #1 Indie Next Pick for May 2010. Currently a staff writer for The Millions, she is married and lives in Brooklyn.